The 91st Missile Wing is a United States Air Force unit assigned to the Air Force Global Strike Command Twentieth Air Force. It is stationed at Minot Air Force Base, North Dakota as a tenant unit. The wing's on-alert missiles are under the operational control of the nation's strategic war-fighting command, U.S. Strategic Command, based at Offutt Air Force Base, Nebraska. The wing's predecessor, the World War II 91st Bombardment Group (Heavy) was a Boeing B-17 Flying Fortress unit formed at MacDill Field, Florida and subsequently stationed with Eighth Air Force in England. It was one of the first United States Army Air Forces (AAF) heavy bombardment groups deployed to Europe in 1942. The 91st Bomb Group was stationed at RAF Bassingbourn and is most widely known as the unit in which the bomber Memphis Belle flew, and for having suffered the greatest number of losses of any heavy bombardment group in World War II. As part of Strategic Air Command (SAC), the 91st wing was one of SAC's longest-lasting and most versatile wings. It was a strategic reconnaissance wing from 1948 to 1957 and a B-52 bombardment wing from 1963 to 1968. Its men flew virtually every plane in the SAC inventory. It became a missile wing in June 1968. 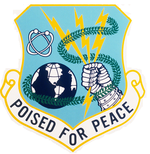 On 1 July 2008 it was designated as the 91st Missile Wing. The 91st Strategic Reconnaissance Wing was constituted 11 October 1948 and activated 10 November at McGuire Air Force Base, New Jersey as one of the first wings organized under the United States Air Force wing base reorganization (Hobson Plan). Under this plan, it was assigned the 91st Strategic Reconnaissance Group, which had been at McGuire for four months, as its operational element. The wing and group moved to Barksdale Air Force Base, Louisiana in 1949. RB-29J bombers were assigned to the wing and its primary mission was global strategic reconnaissance. The group was inactivated in June 1952 when Strategic Air Command converted to the Dual Deputate organization. Under this plan flying squadrons reported to the wing Deputy Commander for Operations and maintenance squadrons reported to the wing Deputy Commander for Maintenance. The squadrons had been attached to the wing and the group reduced to a paper unit in February 1951. In 1950 the wing began receiving air refueling aircraft, first modified KB-29s, then the Boeing KC-97 Stratotanker. In 1950, the 91st was redesignated the 91st Strategic Reconnaissance Wing, Medium. At Barksdale, its wing headquarters was integrated with that of the 301st Bombardment Wing from April 1950 to February 1951. Although each wing conducted independent tactical operations, both were commanded by the same headquarters. The wing detached components for up to three months, primarily to England, and maintained detachments from other units, to provide ongoing reconnaissance of overseas areas. On 11 September 1951, the Wing' moved to Lockbourne Air Force Base, Ohio from Barksdale. The mission of the 91st SRW was to provide aerial reconnaissance and mapping services. 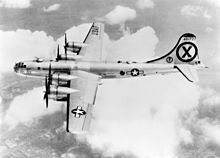 It was equipped with aircraft fitted with cameras to perform this mission, including B/RB-45 and the B/YRB-47. When the wing moved to Lockbourne, a detachment of the wing deployed to Yokota Air Base, Japan, performing combat reconnaissance for Far East Air Forces over the Korean Peninsula flying with RB-29 Superfortresses. Over North Korea, RB-29s were confronted daily by People's Liberation Army Air Force MiG-15s and were no longer able to perform reconnaissance, targeting, and bomb-damage assessment photography with impunity. On 29 July 1952, A 91st Strategic Reconnaissance Wing RB-45C commanded by Major Louis H. Carrington made the first nonstop trans-Pacific flight by a multi-engine jet aircraft from. The plane flew from Elmendorf Air Force Base, Alaska to Yokota Air Base in Japan. Major Carrington refueled twice from KB-29s along the way. This feat earned the crew the 1952 Mackay Trophy for the most meritorious USAF flight of the year. The origins of the wing as a bomber organization began on 1 September 1958 when Strategic Air Command (SAC) established the 4141st Strategic Wing (SW) at Glasgow Air Force Base, Montana. Glasgow was a World War II training airfield which had been reopened the previous year as an Air Defense Command base for interceptor aircraft of the 476th Fighter Group, which was the host unit at Glasgow. SAC assigned the wing to Fifteenth Air Force, and it was transferred to the 821st Air Division in July 1959, but remained a headquarters only until April 1960 when the increasing role of SAC at Glasgow in connection with SAC's plan to disperse its Boeing B-52 Stratofortress heavy bombers over a larger number of bases (making it more difficult for the Soviet Union to knock out the entire fleet with a surprise first strike) led to the transfer of the base to SAC. The 4141st became the host at Glasgow and was assigned the 4141st Combat Support Group and the 861st Medical Group to fulfil this mission. The wing did not become an operational unit until 1961. In January the 68th Munitions Maintenance Squadron was activated to oversee the wing's special weapons. In April three maintenance squadrons were activated and the 326th Bombardment Squadron (BS), consisting of 15 Boeing B-52 Stratofortresses moved to Glasgow from Fairchild Air Force Base, Washington where it had been one of the three squadrons of the 92d Bombardment Wing. One third of the wing's aircraft were maintained on fifteen-minute alert, fully fueled, armed and ready for combat to reduce vulnerability to a Soviet missile strike. This was increased to half the wing's aircraft in 1962. The 4141st (and later the 91st) continued to maintain an alert commitment until inactivation except for periods when the wing deployed to support Operation Arc Light missions. On 1 July 1962 the wing was reassigned to the 810th Air Division (later the 810th Strategic Aerospace Division). However, SAC Strategic Wings could not carry a permanent history or lineage and SAC looked for a way to make its Strategic Wings permanent. In 1962, in order to perpetuate the lineage of many currently inactive bombardment units with illustrious World War II records, Headquarters SAC received authority from Headquarters USAF to discontinue its Major Command controlled (MAJCON) strategic wings that were equipped with combat aircraft and to activate Air Force controlled (AFCON) units, most of which were inactive at the time which could carry a lineage and history. As a result, the 4141st SW was replaced by the 91st Bombardment Wing, Heavy (91st BW), which assumed its mission, personnel, and equipment on 1 February 1963. [note 3] In the same way the 322d Bombardment Squadron, one of the unit's World War II historical bomb squadrons, replaced the 326th BS. The 861st Medical Group and the 68th Munitions Maintenance Squadron were reassigned to the 91st. Component support units were replaced by units with 91st numerical designation of the newly established wing. Each of the new units assumed the personnel, equipment, and mission of their predecessors. Four months later, the wing added an air refueling mission when the 907th Air Refueling Squadron, equipped with Boeing KC-135 Stratotankers was activated at Glasgow. The 91st Bombardment Wing continued to conduct strategic bombardment training and air refueling operations to meet operational commitments of Strategic Air Command. From 11 September 1966 to 31 March 1967 the entire wing, except for a small rear echelon, was integrated into the Operation Arc Light force at Andersen Air Force Base, Guam for combat in Southeast Asia. From 5 February to 15 April 1968, the wing deployed to Kadena Air Base, Okinawa in response to the Pueblo Incident. By 1968, Intercontinental ballistic missiles (ICBM) had been deployed and become operational as part of the United States' strategic triad, and the need for B-52s had been reduced. In addition, funds were also needed to cover the costs of combat operations in Indochina. The 91st Bombardment Wing became nonoperational in May 1968 when Glasgow was temporarily closed and the wing's component units were inactivated in July. The first LGM-30G Minuteman III missile to arrive in the field was accepted by the 91st Strategic Missile Wing on 14 April 1970. The following August, the first Minutemen IIIs were placed on alert status. By December 1971, the switchover to the new missile was completed. With the inactivation of SAC in 1992, the wing became part of Air Combat Command. The wing was a five-time winner of the Blanchard Trophy awarded by SAC and later Air Force Space Command for the winner of the combat missile competition. It also won the Lee R. Williams Memorial Missile Trophy five times as the command's best missile wing and the Thomas S. Moorman Trophy as Space Command's outstanding wing in 1996. On 1 July 1994, along with other missile units, the wing was transferred to AF Space Command. On 1 October 1997, it was redesignated as the 91st Space Wing. On 1 July 2008, it was once again designated the 91st Missile Wing. Along with Twentieth Air Force, the wing transferred from Air Force Space Command to Air Force Global Strike Command in December 2009. In 2009 two missile officers, were charged with stealing classified missile launch technology. The classified material- a device used to detect equipment tampering in the launch facility, was taken in July 2005. The theft came to light in May 2008. The officers were allowed to resign from the Air Force in lieu of facing courts martial. 91st Strategic Reconnaissance Group (later, 91st Operations Group): 10 November 1948 – 28 May 1952; 1 September 1991 – 1 July 1994; 1 February 1996 – present. ^ The misconduct by wing members included three officers who fell asleep on duty in July 2008 while in possession of classified components containing out-of-date missile launch codes for Minuteman III ICBMs and an airman who left a safe containing missile operation precedures unsecured for an entire night. Hoffman, Michael, "Wing commander, 2 others fired at Minot", Military Times, 15 October 2009. ^ a b c d e f g h i j k l m n o p q r s t u v w x y Robertson, Patsy (6 April 2012). "Factsheet 91 Missile Wing (AFGSC)". Air Force Historical Research Agency. Archived from the original on 21 February 2013. Retrieved 17 May 2013. ^ "Boeing RB-29J". National Museum Of the Air Force. 26 June 2009. Archived from the original on 22 January 2015. ^ "Factsheet 821 Strategic Aerospace Division". Air Force Historical Research Agency. 11 October 2007. Archived from the original on 30 October 2012. Retrieved March 20, 2014. ^ "Abstract, History of 4141st Strategic Wing Jan-Feb 1961". Air Force History Index. Retrieved May 19, 2013. ^ "Factsheet 810 Strategic Aerospace Division". Air Force Historical Research Agency. 11 October 2007. Archived from the original on 30 October 2012. Retrieved March 22, 2014. ^ a b Robertson, Patsy (20 June 2011). "Factsheet Twentieth Air Force (Air Forces Strategic)(AFGSC)". Air Force Historical Research Agency. Archived from the original on 19 February 2013. Retrieved 19 May 2013. ^ MacPherson, James, "Officers accused of Minot theft allowed to quit", Military Times, 14 January 2010. "Factsheet 91st Missile Wing". Minot Air Force Base Public Affairs Office. 31 July 2013. Archived from the original on 20 March 2014. Retrieved 20 March 2014.